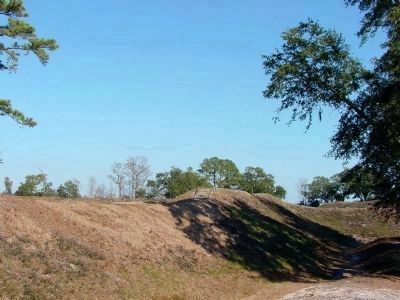 Large Confederate fort stands 13 mi. 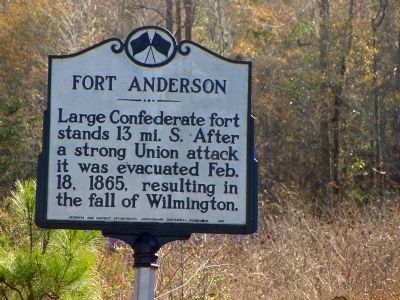 S. After a strong Union attack it was evacuated Feb. 18, 1865, resulting in the fall of Wilmington. Location. 34° 13.7′ N, 77° 59.317′ W. Marker is near Belville, North Carolina, in Brunswick County. Marker is on River Road SE (U.S. 133) south of Route 17, on the right when traveling south. Touch for map. Marker is in this post office area: Leland NC 28451, United States of America. Touch for directions. Other nearby markers. At least 8 other markers are within 3 miles of this marker, measured as the crow flies. Orton (within shouting distance of this marker); Alfred Moore (about 400 feet away, measured in a direct line); Stamp Act (about 400 feet away); Robert Howe (about 500 feet away); USS North Carolina (approx. 1.9 miles away); U.S.S. North Carolina Battleship Memorial (approx. 2 miles away); Beery's Shipyard (approx. 2.3 miles away); William Tryon (approx. 2.3 miles away). Touch for a list and map of all markers in Belville. 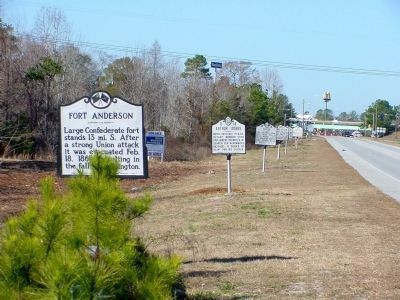 Thirteen miles south at Brunswick Town Historic Site. Credits. This page was last revised on February 5, 2017. This page originally submitted on March 21, 2008. This page has been viewed 1,640 times since then and 9 times this year. Photos: 1, 2, 3. submitted on March 21, 2008, by J. J. Prats of Powell, Ohio.